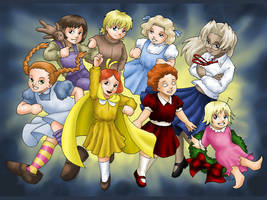 The dolls from the Sailor Hellsing character page. Bases are from Lycentia's SM Graphics. 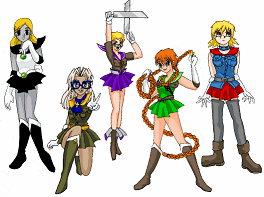 There will be a Sailor Millennium at some point, but this covers the core "planetary senshi" team. So id Sailor Millenium was wearing silver would that make her Silver Millenium? Ahhhh, how many times do I have to say it? I'm not! the two on the left are adorable. Any chance of full sprite sheets? Then it'd be possible to make BKSH fan comics with sprites. Very awesome!! I kinda miss BKSH it was pretty cool. Things get in the way though..we all have lives to live. I think he takes the role of Queen Nehelenia. She never transforms, but she does have that whole "dark counterpart to the Moon Princess" thing going on, so it's close.